1. Water-off & over-temperature protection. When the heating element is heating without water, the power supply will be cut. 2. Over-current protection. If the current exceeds the rated value, the power broken circuit will cut power automatically. l. To ensure the reliability of the sterilization effect chemical indicating piece of biologic indicating piece must be put into the sterilization chamber, together with the: objects to be sterilized. After sterilizing, the sterilization effect can be checked. 2. Safety valve and the exhaust valve are on the top, Safety valve must be checked once every year If it is in malfunction, replace it. If the safety valve is in malfunction during use and the pressure keeps increasing, the power supply must be cut to ensure a safe use. 3. The rubber seal ring is easily aged. If aging causes leakage, the seal ring should be replaced in time. 4. The pressure meter must be standardization every year. 5. The machine must be keeping clean, and protecting the incrustant occurs on the surface, often method is wash it with distilling water once a week. 6. If the overheat protector be damaged, you just take of the round cover on the bottom, and change the protector. 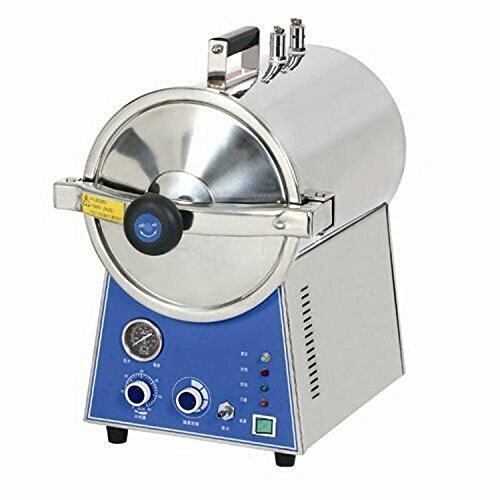 Maximum temperature: up to 134 ℃, suit for 4-6 minutes rapidly sterilizing. It will automatically cut the power and then alarm. Safe protection of water lacking. If you have any questions about this product by Aphrodite, contact us by completing and submitting the form below. If you are looking for a specif part number, please include it with your message.